Rachel has a bag of nuts. For every cashew nut in the bag, there are two peanuts. There are 8 cashews in Rachel's bag. How may peanuts are there? Marianne also has a bag of nuts. In Marianne's bag, for every two cashew nuts, there are three peanuts. Marianne's bag contains 12 peanuts in total. How many cashews are in her bag? Rachel and Marianne decide to mix their bags of nuts together. 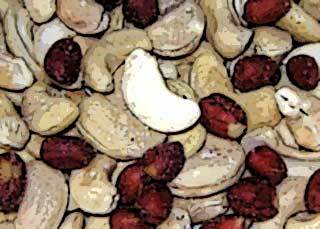 What is the ratio of cashew nuts to peanuts in the mix? Visualising. Combinations. Fractions. Calculating with ratio & proportion. Interactivities. Counters. Ratio. Working systematically. Practical Activity. Games.